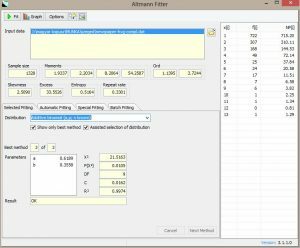 The Altmann-Fitter is an interactive software for the iterative fitting of univariate discrete probability distributions to frequency data. It uses the Nelder-Mead Simplex Algorithm. In its present version it contains more than 200 distributions and is one of the most voluminous collections of distributions at all. It aims at the analysis of data from all empirical domains, e.g. biology, economy, sociology, meteorology, ecology, linguistics, literary science, communication, technical sciences and production. It is indispensable for practitioners. Fitting is automatic, i.e. no initial estimators are necessary, and it improves iteratively. The goodness-of-fit test is performed by means of the chi-square test. A number of options and configurations enables the user to flexibly process data. 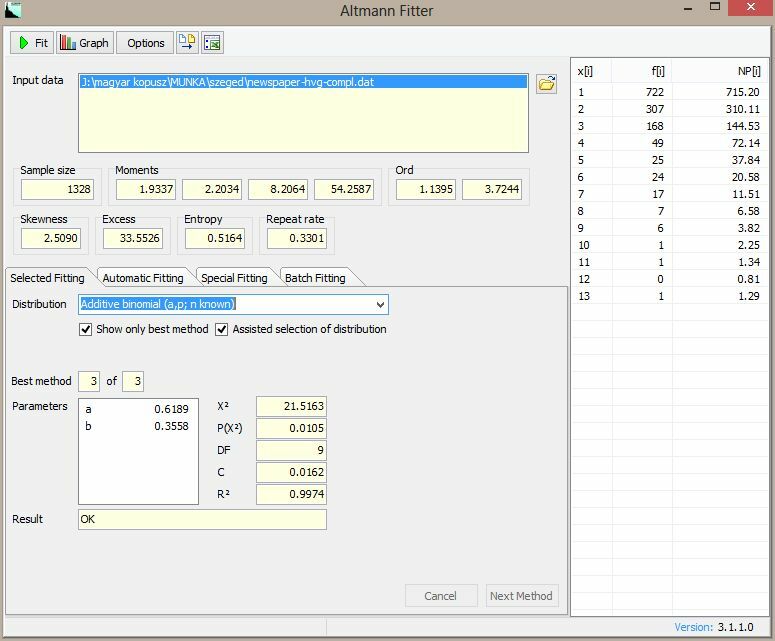 Altmann Fitter runs under all Microsoft Windows® versions since Windows XP® and including Windows 8®. For best performance, the computer should be equipped with at least 512 MB of RAM. Different graphical outputs are available.